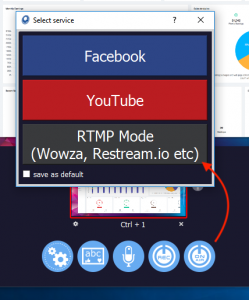 WinBroadcaster allows streaming to RTMP Server. For example you can stream to Periscope. It opens browser page for streaming. You need fill two fields. So see next steps how to get them from Periscope. Press “START” button for start stream. Wait few seconds after start and you can see preview, press “Go LIVE” to publish the stream.